The ocean of Tokashiki Island is blue clearly, the field of view in the water is almost unchanged from the ground, so transparency is about three fingers in the world. The ocean of Tokashikijima which is transparent all the way is a healing space that is exactly longing, which makes the heart of the diving person beautiful. The point of diving is also the most varied in Kerama (Note 1), and all divers will be satisfied even if you have already been in most popular diving places in the world, because this place is overwheming. We will invite you to the best healing spot where coral reefs and white sandy lands. 70% of the diving points on Tokashiki Island are located very close to the island by boat within 15 minutes. When you wear your diving equipment and penetrate through the thin heavy water door, coral reefs like flower garden spread there, and make the color more vivid by the light of the sun and draw attention to the viewer. With the eyes closed, in the underwater world like being in space, surrounded by a flock of colorful fish while feeling weightlessness, when I looked up at the surface of the water suddenly from the white large clouds, Light from the sun can be drawn off. When you take that light, the warmth of the sun is transmitted to the sun, and it will heal the thirst of the city in the city at once. Why do not you just enjoy diving in the ocean of Tokashiki, which will erase the tiredness accumulated in time and mind. Imagine a world where natural objects created by coral reefs, white sand, spread out without swimming from the beach in less than a minute. A healing space where sunlight is drawing down like a curtain from the deep rocky gaps. This mysterious space is worth to be called a curtain of light. There are big creatures like rocks from smaller organisms than rice grains, and there will be encounters with exactly a variety of large and small creatures. They are flocking and stand alone and each has its own ecosystem and stimulate your curiosity. The moment when the sunlight shines on the fish swimming in front of himself in swarms and shines sparklingly. Every single moment you spend in the ground will live in your memory to share with people. I wante to do diving surrounded by various small and large fish in the clear blue ocean of Tokashiki Island. But I didn't not know exactly what kind of sports diving is. Now I will briefly explain about scuba diving for the beginners like me. 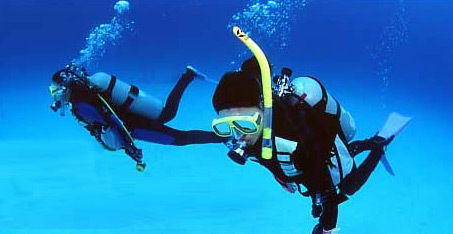 It is called scuba diving to dive while breathing in the water using the cylinder which the diver carrying on the television carries and the equipment which is kept in the mouth. Today, a lot of people are enjoying it as part of their hobby. However, it is dangerous to diving without knowledge at all. For that reason, we recommend that you become a certified diver (authorized card issued as a C-card) that has been trained and trained by internationally recognized internationally recognized diving instructors. Training can be taken quickly in 3 days. The diving guidance organization has various parts, basically it does not change, but there are some differences depending on the guidance organization. Even if you do come to Tokashikijima and want to do diving quickly, even if you do not become a certified diver, there is a program called experiential diving. The time is about 2 hours. Take an explanation on the land and do simple training at the water surface and have you experience the mysterious underwater world of Tokashiki Island over 30 minutes. The depth of the place to go is going from a shallow place with a water surface just above to a place deeper than a telephone pole. Trust me you will get pleasure from evey single moment spend in the iving spot and this healing place with fasinating beauty is something that can't be forgotten during your life.